My first thoughts were of the ceremonial aspects of the word. But, alas, I have no interesting memories of this traditional rite of passage. I loathed high school and graduated college between semesters so no ceremony. Having exhausted that aspect I decided to go to the dictionary where to my surprise I found the #1 definition to be: graduation - a mark on an instrument or vessel indicating degrees or quantity. This brought to mind my quite old and very worn glass measuring cup whose graduation marks have disappeared. I did purchase a replacement, nicely marked and more functional, but still keep the old one. It remains useful. I have many of those in the bakery.
" I did purchase a replacement, nicely marked and more functional, but still keep the old one. It remains useful." I sometimes have reason to wish that, at this time of our lives, we were valued as much as your old Pyrex. Yeah, I feel pretty darned useless a lot of the time. That's a great one....the measuring cup! Good thinking! It never entered my mind. I also have two Pyrex measuring cups, a well marked one and a worn one. I would never think of throwing the worn one away because I do use it for other things, too. Thanks, I was blank so looking at the dictionary helped. Looks like a lot of us keep our old Pyrex. Some of my kitchen stuff was my mothers. I think so, too. The few things I do have that were my mother's, I just can't bear to ever part with. And I still have and use things that she gave me to set up housekeeping when I got married over 50 years ago. Me too. And I wasn't even that close to my mother. Weird. I'm like you. I buy a new one but keep the old one and keep using it! I didn't have any graduation ceremonies...until I finished my degree. I didn't go to the ceremony because I thought...it was just a degree. My fellow classmates gave me a photo of them. We were only a small number - eight at most. At my granddaughter's graduation from primary school to high school, I fainted. Funnily enough, No 1 daughter has not invited me to any more. So, I don't think graduations are for me. Most of my kitchen utensils are ancient. 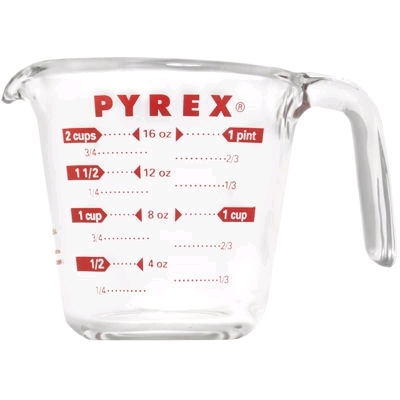 I have 2 Pyrex measuring cups. One like pictured and the second is even bigger. I got the bigger one when I used to make soap and needing to measure in bigger quantities. I have an old glass one that was my husband’s grandmothers that actually has raised graduation marks so they will never fade away.